While you were away MacMillan's sent for me to see whether I would let them have and a Western story to go in a series of American novels they are bringing out. I said, unwisely, that I was not free to do so. During the last few years I have met several propositions from other publishers in the same way. I hate the bother of changes, and business transactions are never a pleasure to me. 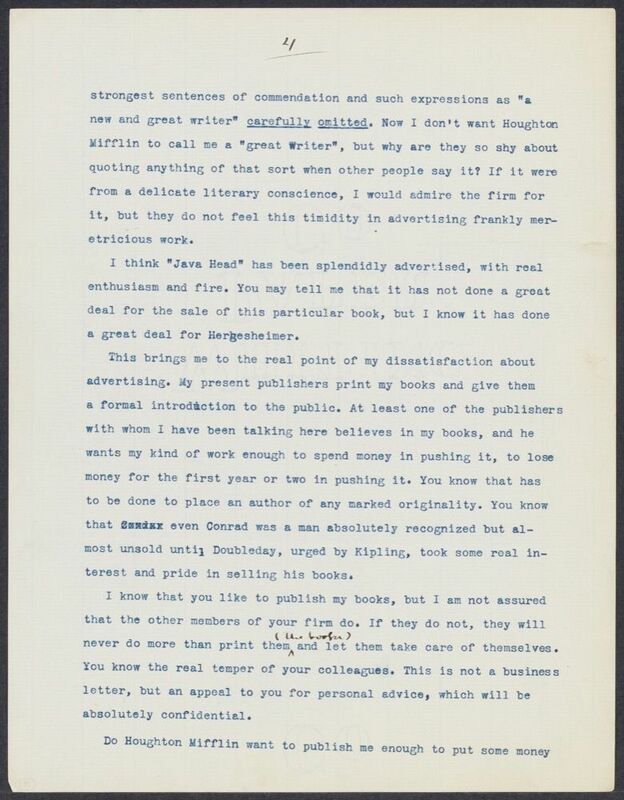 I have avoided talking to publishers because it made me restless and discontented, and because my relations with you, personally have always been so pleasant, even in business. But this bill for proof corrections has brought things to a head with me. I do not think it a just charge. I kept duplicate proofs, with the corrections, until after your first statement came in; then, as there was no charge entered, I threw them away. I do not think it is the custom of publishers to make these charges in the case of painstaking writers in whom the publisher, so to speak, "believes". I have just seen some of Mr. Drieser's5 proofs; his books are practically re-written in proof, and he is never charged a cent for corrections. Do not Houghton Mifflin make this charge as a sort of luxury tax on a carefully written book? I don't mean I doubt that there is some a charge from the printer, but it seems that a publisher usually pays this charge for a book he wants and is glad to handle. MacMillans, whose books are well printed, tell me that the cost of composition on a long novel at the present time, is about $600.00, and that author's proof corrections cost about a dollar an hour. If my book cost $500.00 for composition, then by the 20% quoted in the contract, you would give me a hundred dollars' worth of proof corrections without charge, would you not? Add to that the amount you take out of my royalties, for and we have author's corrections amounting to $244.00. Is it possible that it took one man thirty working days to make my corrections? You may tell me that the Riverside6 compositors charge more per hour, but why, after all, should your authors be charged more than MacMillans'? Within the last few weeks, three New York2 publishers have made me definite propositions for my next book, offering better terms than my present publishers make me; and in addition to increase in royalties and $100.00 $1000.00 to $1500.00 cash advance on delivery of copy, they offer to give the book and me much better advertising than I have hitherto had. One firm7 has outlined an advertising scheme which seems to me excellent. They believe that the aim of avertising is not so much to sell one particular book, or to be careful to come out even on one book, as to give the author a certain standing which would insure his future and interest in his future books. Houghton Mifflin's policy of may work out well for them as a business policy, but I do not think it works out well for me. I think that the recognition of the public and reviewers has outstripped that of my publishers. This has been borne in upon me by a hundred little and big things until it has become a conviction. The publishers have made no use of this growing appreciation, and take no account of any evidence of it except the evidence of sales, which, with work like mine, is not indicative of the real interest. I want to say a word about reviews. I know it is your theory that reviews do not sell a book. But some publishers do make them sell books. Several men have told me here that they believed that the review8 of "Java Head"9 in the New Republic10 sold11 several thousand copies of the book. I know a number of people who bought the book after reading that review,- I did so, at once,- and they are all [illegible] people who help to make opinion. I believe the New Republic never received copy of my last book12, and Mr. Hackett13 protests, not to me but to people to whom he would speak more frankly than to me, that his attention was never called to it by the publishers as being an unusual book. You remember that after writing you twice14, asking you to send a copy to the editor of the Globe15, I had to take a copy to Mr. Dawson's16 house myself. 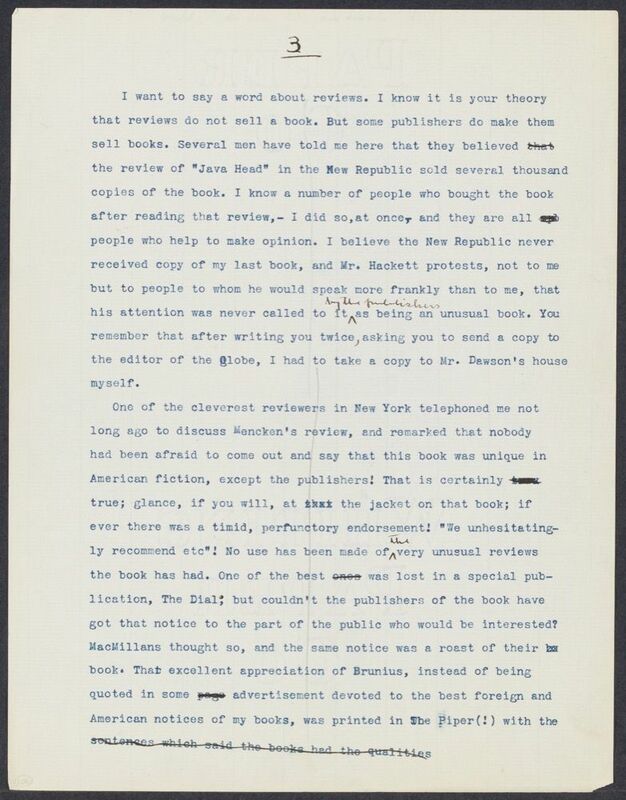 One of the cleverest reviewers in New York telephoned me not long ago to discuss Mencken's17 review18, and remarked that nobody had been afraid to come out and say that this book was unique in American fiction19, except the publishers! That is certainly [illegible]true; glance, if you will, at that the jacket on that book; if ever there was a timid, perfunctory endorsement! "We unhesitatingly recommend etc"20! No use has been made of the very unusual reviews the book has had. One of the best21 ones was lost in a special publication, The Dial22; but couldn't the publishers of the book have got that notice to the part of the public who would be interested? MacMillans thought so, and the same notice23 was a roast of their bo book. That excellent appreciation24 of Brunius25, instead of being quoted26 in some page advertisement devoted to the best foreign and American notices of my books, was printed27 in The Piper28 (!) with the sentences which said the books had the qualities 4 strongest sentences of commendation and such expressions as "a new and great writer" carefully omitted. Now I don't want Houghton Mifflin to call me a "great writer", but why are they so shy about quoting anything of that sort when other people say it? If it were from a delicate literary conscience, I would admire the firm for it, but they do not feel this timidity in advertising frankly meretricious work. I think "Java Head" has been splendidly advertised, with real enthusiasm and fire. You may tell me that it has not done a great deal for the sale of this particular book, but I know it has done a great deal for Hergesheimer29. This brings me to the real point of my dissatisfaction about advertising. My present publishers print my books and give them a formal introduction to the public. At least one30 of the publishers with whom I have been talking here believes in my books, and he wants my kind of work enough to spend money in pushing it, to lose money for the first year or two in pushing it. You know that has to be done to place an author of any marked originality. 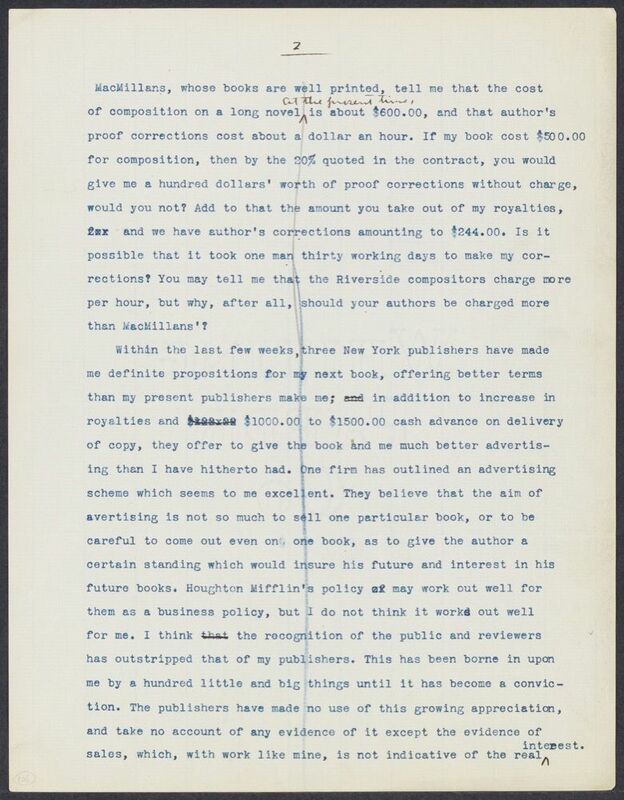 You know that Condar even Conrad31 was a man absolutely recognized but almost unsold until Doubleday, urged by Kipling32, took some real interest and pride in selling his books. I know that you like to publish my books, but I am not assured that the other members33 of your firm do. If they do not, they will never do more than print them (the books) and let them take care of themselves. You know the real temper of your colleagues. This is not a business letter, but an appeal to you for personal advice, which will be absolutely confidential. Do Houghton Mifflin want to publish me enough to put some money 5 into them my books, and to give my next novel34 as many inches in of advertising as have been given to "Java Head", for instance. That book is still being advertised, by the way, while Antonia was long ago do dropped out of Houghton Mifflin's ads. Is not the Houghton Mifflin mind and heart entirely fixed upon a different sort of novel? Frankly, I despair of any future with them. I see35 they have now on hand eight copies of "The Song of the Lark"36 and four of "O Pioneers"37. That seems to me indicative of the cautious spirit in which they have always handled my work. They don't believe they can make much on me, but they will be very careful not to lose much. Books like mine require a special kind of publicity work. The New York publisher with whom I have talked most will give them that, and he will let me cooperate with his publicity department. I must give him his answer very soon. I don't like to have my books come out in two groups, from two publishers; and I suppose if I go to antoother publisher Houghton Mifflin won't keep even four copies of any of my books on hand! But as it is, they never take advantage of the fact that every review of Antonia was a review of my three novels and discussed them all as things forming a group by themselves. The three books are never advertised together as a presentation of special features of American life, as Knopf38 advertises all of Hergesheimer's books, even those that are out of print. I don't care about the cash advance and that sort of thing, but I know I can work better for a firm that can give me some of its ingenuity and enthusiasm. 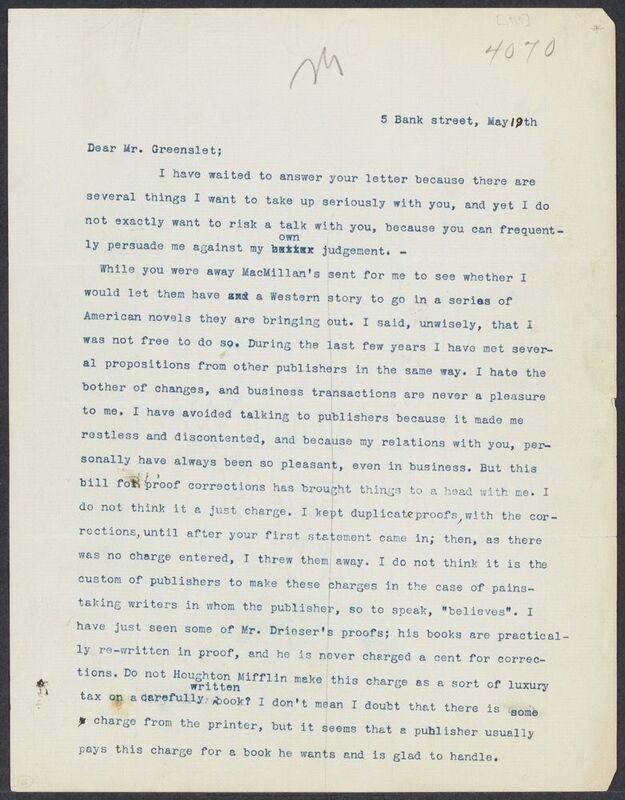 The year of this letter is established by corresponding letter from Houghton Mifflin staff. On 3 May 1919, Greenslet wrote that he had hoped to see her the day before when he passed through New York City on his way back from England. He then explained that excess proof correction charges for My Ántonia that appeared on her May statement were to originally appear on her statement six months earlier, but he asked to have them held over. He was now, however, "reinstating the debit" in light of the novel selling "fairly well" and earning "a fair margin." He enclosed a check for $74.69, with the balance of $337.14 to be paid 1 September 1919. The press owned by Houghton Mifflin. This was likely Alfred A. Knopf, Inc., but there is no definitive evidence. 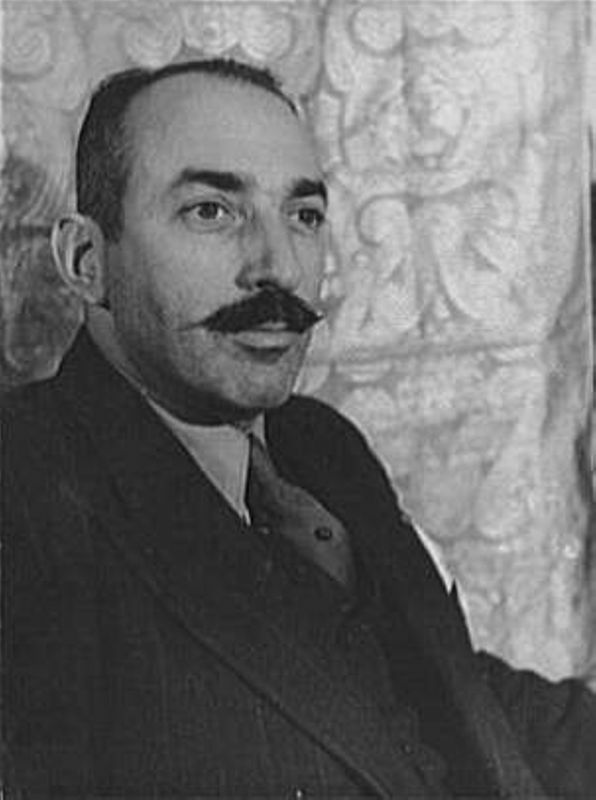 Hergesheimer's novel was published by Alfred A. Knopf, Inc. In Mencken's review, he describes My Ántonia as "not only the best done by Miss Cather herself, but also one of the best that any American has ever done, East or West, early or late." The full text on the front cover of the dust jacket is as follows: "Of all the remarkable women that Miss Cather has created no other is so appealing as Ántonia, all impulsive youth and careless courage. Miss Cather has the rare quality of being able to put into her books the flame and driving force of unconquerable youth. MY ÁNTONIA is a love story, brimming with human appeal, and a very distinguished piece of writing. We unreservedly recommend it to all lovers of good stories and those who appreciate the very best in fiction." Bourne juxtaposes My Ántonia with William Allen White's In the Heart of a Fool (1918, published by Macmillan). He harshly criticizes White's novel and praises Cather for writing a "book that has taken herself out of the rank of provincial writers and given us something we can fairly class with the modern literary art the world over that is earnestly and richly interpreting the spirit of youth." Junius's essay on Cather, which was published before any of her works had been translated into Swedish, it's title tranlsating as "The Swede Abroad as Novel Character." He praised Cather for depicting Swedish characters in O Pioneers! and The Song of the Lark "with real insight and art as Swedes" and counseled Swedish readers that Cather "deserves to be read by Swedes not only because she has written about Swedes, but just as much because she is an artist who has something important to tell us." A copy with an advertisement for My Ántonia bound in has not been located, but Houghton Mifflin reissued Peabody's play in the Riverside Literature Series in 1919. 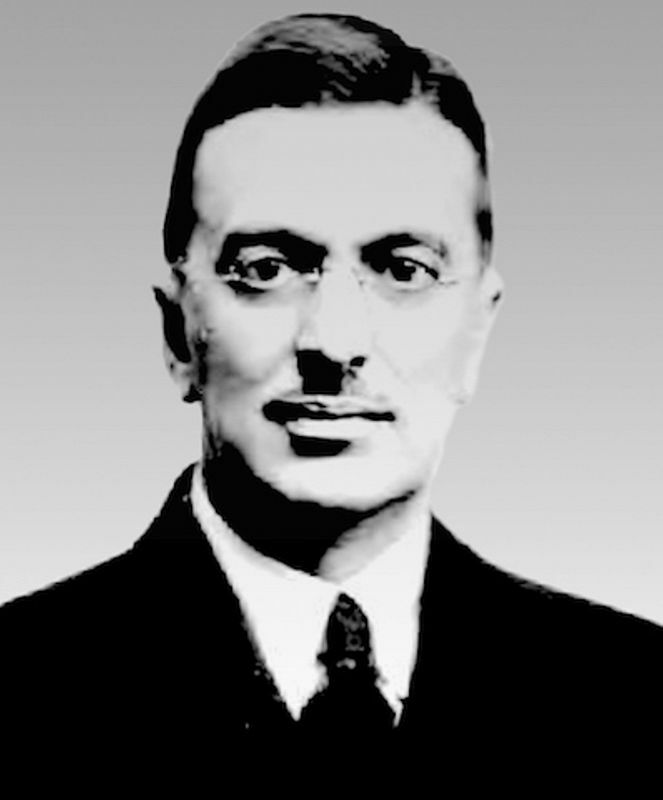 This is likely Alfred A. Knopf of Alfred A. Knopf, Inc., although there is no definitive evidence. Although Cather does not name him, Greenslet would have understood that Cather's correspondence with Roger Scaife of Houghton Mifflin about the illustrations for My Ántonia had aggravated her. Cather derived these numbers from the copyright statement in which the proof corrections were deducted from her royalties. As Greenslet explained on 23 May 1919, these numbers referred only to bound stock. 500 hundred copies of The Song of the Lark were in stock in unbound sheets; the situation with O Pioneers! was similar. Hackett, Francis (1883-1962). 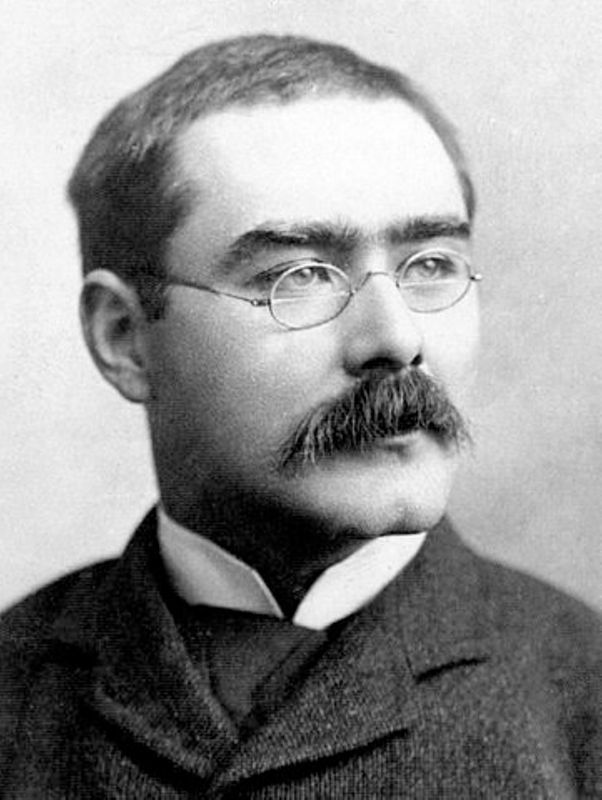 Irish-American writer and journalist. Born in Kilkenny, Ireland, to John Byrne Hackett and Bridget Doheny Hackett, Francis Hackett emigrated to the United States in 1901. He first wrote for the Chicago Evening Post and founded its Friday Literary Review in 1909. From 1914 to 1922 he was associate editor of the New Republic, where he favorably reviewed Willa Cather’s work. Hackett also served as special correspondent for the New York World from 1920 to 1923 and as book critic for the New York Times from 1944 to 1945 and wrote several books. After he returned to Europe the King of Denmark awarded Hackett the Liberty Medal in 1946. Dawson, N. P., Mrs. American book critic. Dawson regularly wrote book reviews for the New York Globe and Commercial Advertiser from as early as 1914 and into the 1920s. She signed reviews as N.P.D. or N.P. Dawson, and press reports called her “Mrs. N. P. Dawson.” Cather was not the only reader to mistakenly believe that Dawson was a man, although it is surprising that in a letter to Ferris Greenslet complaining about the failure of Houghton Mifflin to supply reviewers with copies of My Ántonia she reports that she personally delivered a copy to “Mr. Dawson’s house” (#0461). Brunius, August G. (1879-1926). Swedish literary critic. Born in Stockholm, Sweden, to Johan Gomer Tor Brunius and Kristina Matilda Bagge Brunius, August Brunius was one of the most influential literary critics in Sweden and is credited with introducing the Scandinavian reading public to Willa Cather. Cather appreciated Brunius’s promotion of her work in his 1918 article in the Swedish weekly Idun. Hergesheimer, Joseph (1880-1954). American novelist and short story writer. Born in Germantown, PA, Joseph Hergesheimer trained as a painter at the Pennsylvania Academy of Fine Arts in Philadelphia. In 1913 he sold his first short stories to the Forum magazine. Mitchell Kennerley, who published his first novel, The Lay Anthony (1914), introduced Hergesheimer to Alfred Knopf, and Alfred A. Knopf, Inc., brought out Three Black Pennys (1917) and all of the subsequent books. 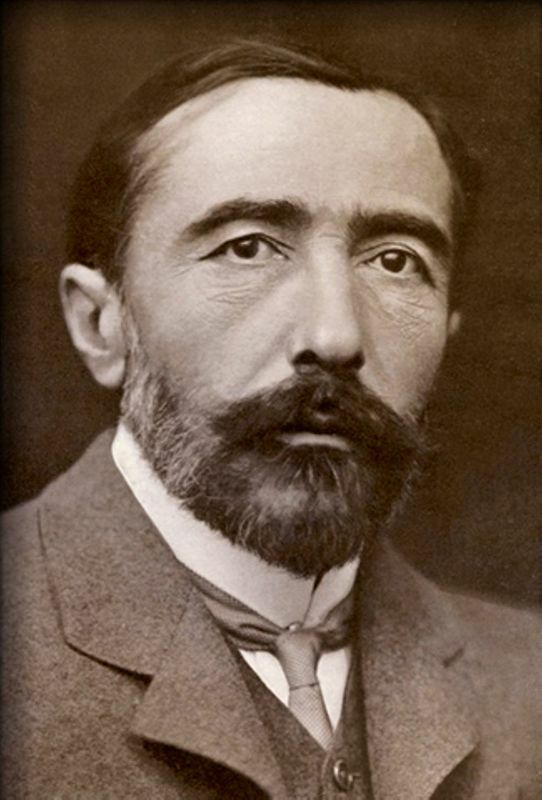 Hergesheimer was known for the lush aestheticism of his prose and his “exotic” foreign settings. His reputation was at its height in the early 1920s but went into a decline thereafter. 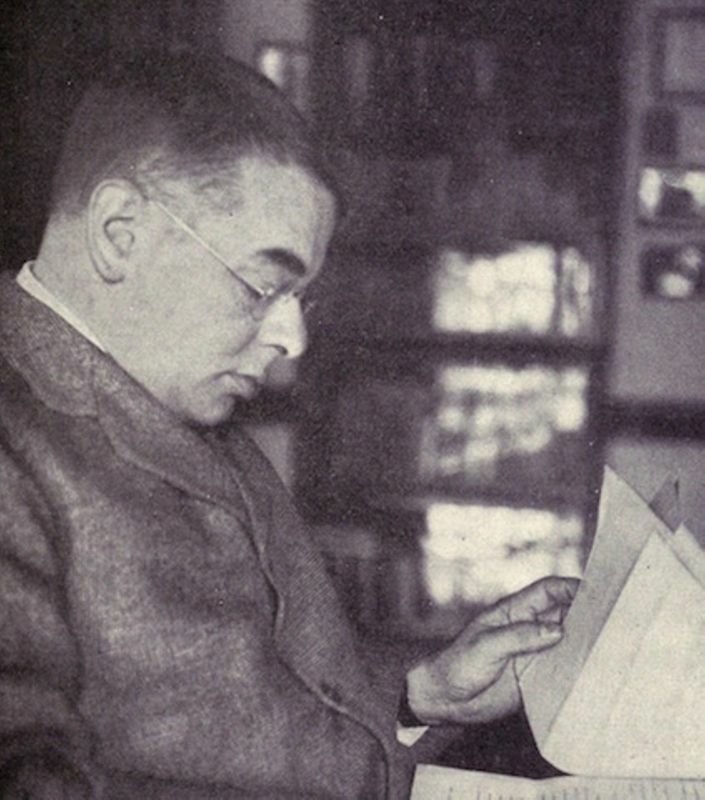 It is not clear whether Willa Cather ever met Hergesheimer in person. 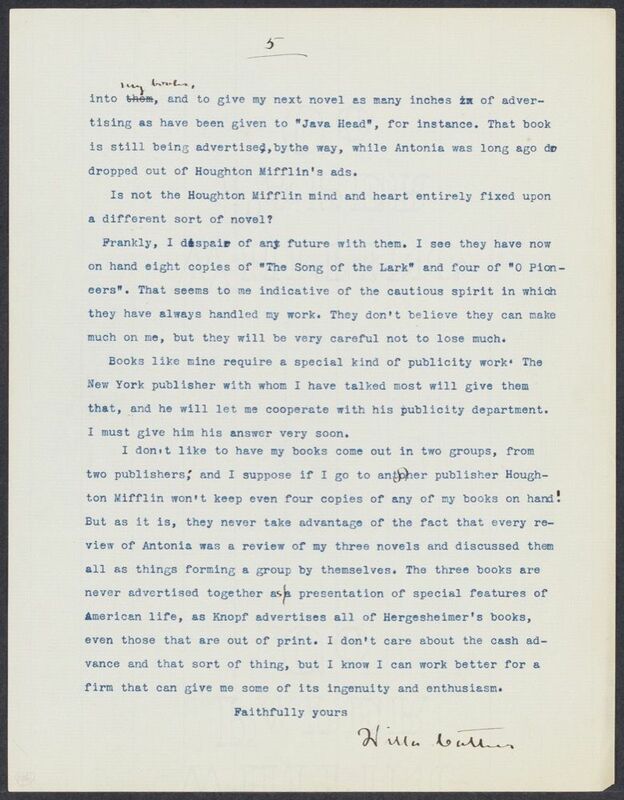 However, she admired Knopf’s advertising of Java Head (1919), comparing it unfavorably to Houghton Mifflin’s lackluster marketing of her books, and the contrast informed her decision to leave Houghton Mifflin for Knopf. "Salem Revisited," New Republic (February 22, 1919) by M.A.